Recommended credits are shown in parentheses. Courses are subject to change at the discretion of the University of Granada. ECTS: The University of Granada awards ECTS (European Credit Transfer and Accumulation System) credits. The number of class hours and ECTS credits will be shown on the transcript to allow each student’s home institution the ultimate decision in the awarding of U.S. credit. Recommended U.S. semester credits next to each course are based on 15 classroom hours per semester credit and are not a conversion of ECTS credits. Students should consult with their university advisors prior to participating in the program to have course credit pre-approved and ensure that they are taking the appropriate amount of credits. AIFS recommends that students gain pre-approval for several levels of Spanish in order to ensure that credit is accepted for the course that students test into following the placement test. The Early Start Option is 4 weeks in length in the Fall with 80 contact hours for 5 credits and 3 weeks in length in the Spring with 60 contact hours for 4 credits. This level is for students who have no previous knowledge of Spanish. During this course, students will be able to understand and express themselves in everyday situations and those related to their personal experiences. Students will be able to exchange simple and direct information. Included topics are: present tense indicative of regular and irregular verbs, demonstrative and possessive adjectives, pronunciation and intonation, uses of “ser”, “estar” and “hay”, frequent reflexive verbs and definite and indefinite articles. Students who have studied Spanish only in high school or one or two semester(s) in college generally place in this level. Students will be able to understand and express themselves in everyday situations and those related to their personal experiences, with basic language recourses. Students will be able to exchange simple and direct information. Included topics are: forms and uses of the gerund; forms and uses of “gustar”, “encantar”, “interesar”, the differences between “ser” and “estar”, the preterit perfect tense; positive imperative and expression of cause and excuse. A bridge level between the Elementary and Intermediate levels, this course concentrates on increasing students’ oral and written skills. Students who have studied one or two semester(s) in college generally place in this level. Students will be able to ask for and give personal information, compare, express opinions, security and insecurity and judgments. Grammar topics include: demonstrative and possessive pronouns, direct and indirect object pronouns, the preterit, the imperative and the imperfect tenses. Students who have studied Spanish throughout high school and continued with one or two semester(s) in college, usually place in this level. Students will be able to understand and express themselves in general situations that require the exchange of information and show personal attitudes about many themes, not exclusively related to personal experience. Content includes: contrasting uses of the indefinite and the indicative perfect, morphology and uses of the indicative imperfect, “hace”, impersonal “se”, “parecerse”, and possessive adjectives and pronouns, making hypothesis. Students who have studied Spanish throughout high school and continued with two or three semesters in college, usually place in this level. The course is similar to Spanish 102, however focus is on communication skills and grammar plus the future and conditional tenses are covered. Content also includes: morphology and uses of the present subjunctive, giving advice, morphology and uses of the imperfect subjunctive. Students with at least five semesters of college Spanish, experience living in a Spanish-speaking country or Spanish study on a regular basis since elementary school usually place in this level. During this course, students will be able to understand and express themselves in multiple and unfamiliar situations that require exchanging information with complex linguistic structures. Content includes: uses of the imperfect, preterit, conditional, imperative, and subjunctive, correlation of the tenses in specific situations–arguments, debates, degrees of possibility, causes, consequence, etc., direct and indirect object pronouns, and the impersonal “se”. Students with at least five semesters of college Spanish, experience living in a Spanish-speaking country or Spanish study on a regular basis since elementary school usually place in this level. The course is similar to Spanish 301 but with greater emphasis on the subjective. Specific content includes: use of the subjunctive in forming opinions, values and attitudes, marginal uses of the imperfect: dreams, fiction, virtuosity, use of the compound conditional in the formulation of hypothesis and phonetic characteristics of Spanish. Students with at least six semesters of college Spanish usually place in this level. Students will be able to understand and express themselves correctly and with fluidity in situations familiar to them and communicate adequately in unfamiliar situations through linguistically complex structures. Cultural content includes themes such as “20th Century Spanish History”, “The Cultural Legacy: Christians, Jews and Moors”, and “Gastronomy: The Mediterranean Diet”. Bilingual students generally place into this level. The course is similar to Spanish 401 but with greater emphasis on prepositional patterns of verbs, problematic prepositions, proverbs and sayings, lexical adaptations on different sociolinguistic levels, and varied conversational recourses. Cultural content includes themes such as: “The Family Structure”, “Principle Political, Cultural and Ideological Tendencies in Today’s Spain”, “Bullfighting” and “Flamenco”. For beginner or intermediate level Spanish students. Choose 2 or 3 electives in addition to the required courses. A general review of Spanish grammar. Differences between ser and estar, tenses in the indicative mood, constructions with si, que and como, prepositions and pronouns. Uses of the subjunctive. Meets 3 hours per week. Intensive practice in speaking and writing Spanish. Emphasis is on pronunciation and vocabulary through discussion of contemporary topics. Regular composition exercises improve written skills. Meets 3 hours per week. Spanish art from its origins to the present: pre-historic art, Spanish- Roman, Visigoth, Islamic, Romanesque, Mudejar, Gothic, Renaissance and Baroque periods. Neoclassicism, Romantic art and Impressionist painting, sculpture and architecture. This course is aimed at those students who wish to learn the general language of economics along with the study of Spanish economics and that of the main Latin American countries including Argentina, Uruguay, Cuba, Chile, Brazil, Peru, Colombia and Venezuela. Also, the differences in culture and protocol for doing business with the Spanish and with Latin Americans will be studied. Spain’s climate and vegetation, development of towns and population distribution, agriculture and industry, internal communications, foreign trade, tourism and the evolution of the Spanish economy. Geography 310E (3) | Sustainability in the Mediterranean: Approaching local self-sustainable development. This course is designed to provide students with a comprehensive approach to a local self-sustainable practice, models and cultures in the Mediterranean region. Students will also identify and compare the community practices and local governances in the Mediterranean region contrasting the city and rural landscape configuration in the Mediterranean region, Granada and its surroundings. This course offers a generic view of the most important aspect of the Spanish health system and its comparison with other European systems. The course also identify which factors determine the level of health of a population. The relative importance of these factors will be analyzed on the basis of the characteristics of a country, as well as the interventions that are made for prevention and control by the public health system. Spain’s history from the first settlers to the present: Mediterranean colonists, Roman colonization, Islamic invasion, Reconquest, Catholic kings, Emperor Carlos V, the 18th century and the War of Independence and Restoration. Political, social and economic problems from 1900-36, the Civil War, Franco Regime and post-Franco period. This course traces the major movements and principal authors of Spanish literature. Movements and periods studied include: Medieval romances, the “Siglo de Oro”, Romanticism, 20th century. Genres such as drama, poetry and novels are studied. Authors and works such as La Celestina, Lazarillo de Tormes, Miguel de Cervante’s Don Quijote, Lope de Vega, and F. Garcia Lorca are studied. The aim of this course will be to enable the student to understand/acknowledge the concept of international marketing and its function within the global markets; the socio-economic, political, legal, cultural, technological and competitive dimensions of the current international scenario such as its potential impact onto the development of the international marketing strategies; and the different approaches to the process of internationalization, as well as the main drivers and obstacles to the internationalization. This course provides a comprehensive introduction into the making, development and implementation of the European Union environmental politics. This class compares and contrasts the political system of Spain and those of the principal countries of the European Union. Topics include: the Classification of Different Political Regimes, the Democratic Political Systems, and Forms of Government and the Political Systems of Britain, Germany, Austria, Switzerland and France. The political system of Spain is studied in depth including: contemporary history of Spanish politics, the Constitution of 1978, the transition to democracy, three branches of government, territorial organization of the Spanish State, electoral system and the political parties in Spain. This course covers the basic cultural and political interaction between the Arab world and the West during their common history. From the emergence of Islam to the Iraq war through the crusades, the Ottoman Empire and the western colonization, the focus is on the main challenges for relations between the Arab world and the West. Islamic influence on Spain’s history, tradition, life, language and culture. The concept of Islam, the message of the Koran, Andalucia under Islamic rule, North African dynasties in Andalucia, the Nazari dynasty of Granada, cultural, literary and artistic aspects of Islam, Islamic architecture and symbols exemplified by the Alhambra. Spanish civilization and contemporary society through themes such as the relationships between professional, labor and cultural sectors, the aging of the population, gypsies, bullfighting, holidays, gastronomy and flamenco. Audio-visuals, newspapers, magazines and texts are used. Basic elements of Latin American culture are addressed to provide an understanding of its complexity. The American geographic environment, racial distribution and historical evolution, demographics and problems of growth, family structure and daily life, social groups and their behavior, political tendencies, current ideologies, dependence, underdevelopment, external debt, art and folklore. STEM 301E (3) | Developing competence in Science, Technology, Engineering and Mathematichs. This course introduce and give examples of actions and tasks that provide opportunities to develop STEM competence in students. It will be explored in details problems of modeling and some aspects of scientific inquiry. It will also discuss the use of technology to gather data from surroundings and thus propose contextualized and authentic data. French Language and Culture at 100 beginner, 200 pre-intermediate, 300 intermediate and 400 advanced levels. Italian Language and Culture at 100 beginner, 200 pre-intermediate, 300 intermediate and 400 advanced levels. For students with a high intermediate or above level of Spanish. Choose 2 or 3 electives in addition to the required courses. A complete study of Spanish grammar for students at an intermediate level. Tenses, constructions and usages. Regular and irregular verbs, imperatives, the indicative versus the subjunctive and active and passive constructions. Students must have at least two years of college Spanish to take this course. Discussion of topics of contemporary interest. Emphasis on grammar, vocabulary, pronunciation, conversation and composition. Designed for students who already have a sufficient fluency in Spanish and who wish to become more expressive in the everyday language. Special attention is paid to vocabulary, the semantic differences of words in Spain and Latin America, gestures, phrases, slang and sign language. Themes are practiced through oral discussion, written essays and audio tapes. For intermediate students, this course offers a realistic and lively approach to situations encountered in careers, especially if interested in improving knowledge of the Spanish and/or Latin American business world from a cross-cultural perspective. Oral and written communication skills are developed with materials used in business. Spanish art development from Arabic origins to the present including Moslem, Visigothic, Mozarabic, Romanesque, Mudejar, Gothic and the Renaissance and Baroque. The Spanish masters Velazquez, Goya, Picasso and Dali. 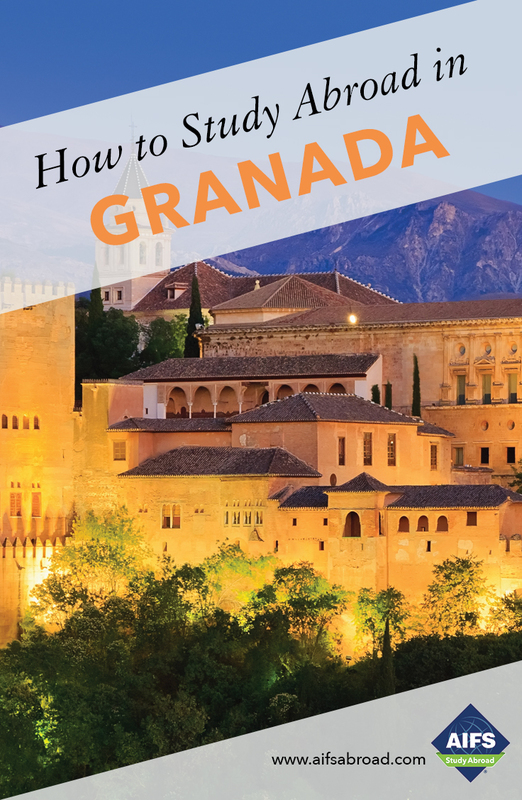 Visits to historical sites in Granada such as the Alhambra, Cathedral and Royal Chapel. Major movements and principal authors of Spanish and Hispano- American literature. Drama, prose, poetry and novel genres. Authors include Cervantes and Zorrilla. Works include Lazarillo de Tormes, La Celestina and Don Quijote. Spanish authors and literary movements in the 19th and 20th centuries such as Bécquer, Valle Inclán, Federico García Lorca, Gabriel García Márquez and Romanticism. Through the study of ancient songs, this course explores their importance in Spanish society. Special attention is paid to the poetic language of the lyrics and the understanding of song as a cultural vehicle. Musical genres include cante jondo, flamenco, los romances, and sephardic song. This subject attempts to offer a general picture of the political, social and cultural aspects of Spanish reality today. It gives an overview of the national press, radio stations, television channels, Internet and film topics over the last few years. For students with a high advanced or above level of Spanish. Choose up to 4 electives in addition to the required course. At least three years previous study of Spanish at the college level. Concentrated work on written skills through regular composition exercises as well as conversation and discussion of topics of contemporary interest. Students must have at least two years of college Spanish. Specific content includes: use of the subjunctive in forming opinions, values and attitudes, marginal uses of the imperfect: dreams, fiction, virtuosity, use of the compound conditional in the formulation of hypothesis and phonetic characteristics of Spanish. Theoretical and practical usage of the Spanish language. Verb structures, indicative tenses, use of the subjunctive mood, the imperative, impersonal and passive constructions and uses of ser and estar. Pronouns, prepositions and adverbs. Constructions with si, como and que. Sentence structure and syntax through regular oral and written exercises. Students are required to have at least three years of college Spanish. For students who already have sufficient fluency in Spanish and wish to become more expressive in everyday language. Vocabulary, semantic differences of words in Spain and Latin America, gestures, phrases, slang and sign language. Practice is through oral discussion, written essays and audio tape transcribing. For advanced students, a realistic and lively approach to situations encountered in careers; especially if interested in improving knowledge of the Spanish and/or Latin American business world from a cross-cultural perspective. Oral and written communication skills are developed with materials used in business. Translating English to Spanish, increasing vocabulary and syntactical skills. Documents, poems, recipes and articles are translated. Students are evaluated weekly on individual translations out of class and during class on small group translations. Students will continue to refine skills acquired in Translation I by studying strategies for translation, instruments, resources and documentation. Students will complete written and oral translation exercises. Prerequisite: Translation I. This course will familiarize students with the fundamental themes of linguistics as the science of language. Students discuss the linguistic diversity of our planet, how languages live, how they are constructed, how and why they change, how they are related, but also how and why they disappear. Students examine the world of universal linguistics and analyze the relation between language and world vision and view of the evolution of linguistics and its methods. This course focuses on two important periods of Spanish art, the Renaissance and the Baroque, by studying the main artists and works such as El Escorial, El Greco, Berruguete, Martínez Montañés, Ribera and Zurbarán. This course relates the principal artists and works to the social, cultural and political changes in Spain during the contemporary age. Artists such as Goya, Gaudí, Picasso and Dalí are studied. The history and culture of Spain through the history of Spanish cinema. Origins of Spanish film (1896-1930), Luis Buñuel, “talkies” films in the Republic, cinema as an ideological tool under Franco and Spanish cinema after the return of democracy. This subject approaches the contemporary historical development of these countries. It will cover Spanish history from the Post-war period (50s), an overview of the 20th century and the first decade of the 21st century. It will also cover Latin American history from the Populist movements of the 50s to the migratory movements of the late 20th century, and include a reflection on the first decade of the 21st century. This course approaches European society through contemporary European films. It attempts to provide a perspective of the social, economic and ideological change, taking the main directors and films dealing with these themes as a reference. The general language of economics, the study of the Spanish economy and the economies of the main Latin American countries through a variety of activities. The differences in culture and protocol for doing business with Spain and Latin America. The industries in Spain: farming, fishing, manufacturing and tourism, Spanish investments overseas, and the economies of Argentina, Uruguay, Chile, Brazil, Peru, Colombia, Venezuela, Panama and Cuba. This course familiarizes students with the basic questions related to bilingual education: “¿What is bilingualism?”, “Different models in Bilingual education”, “Management of the Bilingual Classroom as a model of integrated learning”. Students will integrate the learning of the knowledge and skills needed to be a teacher of Spanish as a Foreign Language with practice and improvement of their own language skills. Focus on the theoretical and practical content to be presented and practiced in Spanish, with the consequent development of Spanish specific to the field of linguistics applied to the teaching of the Spanish language as well as grammar points, linguistic functions, sociocultural content, etc. The course provides a theoretical understanding, via analysis, of the major environmental problems in Spain, outlining the causes of the current situation as well as future perspectives and possible forms of intervention. Case studies are used to enable the student to understand the potential, risks, opportunities and impact of the Spanish environmental framework. This course focuses on the most important political, economic, social and cultural developments that took place over more than two centuries. The starting point is the establishment of the House of Bourbon in Spain and it ends with the installation of the Franco regime. This period is of utmost importance in understanding Spain today. Political, social and economic development of Spain from the Franco regime (its ideology and sociopolitical evolution) to the present. The Catholic church’s relationship with the state, the time of transition, the constitution, economic development and internal and international problems of the present government. The social structure, demography and administrative organization of the American indigenous tribes as well as the Spanish republic and its commercial monopoly, productive sectors and education, art and culture. The defense of the Spanish American empire and 18th century reforms and economic evolution. Characteristics, historical and political tones of the time. Drama, prose, poetry and novel genres, portraying literature’s “Golden Age” of La Celestina, Lazarillo, San Juan de la Cruz, Cervantes’ “Don Quijote”, Lope de Vega’s “Fuente Ovejuna”, Alarcón’s “Sombrero de tres picos”, Manuel de Góngora, Quevedo and Calderón de la Barca’s “La vida es sueño”. Spanish literature in the 18th and 19th centuries and comparative movements in other countries. Drama, prose, poetry and the novel. Comparison of three periods of Spanish literature and similar tendencies in other countries: (i) the end of the 19th and beginning of the 20th century, (ii) avant garde to the Spanish Civil War and (iii) post-war to the present. Literary currents of Hispano-American countries throughout five centuries of American literature in Spanish. Azuelo’s “Los de abajo”, Rivera’s “La Voragine”, Jorge Luis Borges’ “Ficciones”, Pablo Neruda, Gabriel García Márquez and Carlos Fuentes. The study of Spanish literature during the 18th to 21st centuries through the images of women produced in texts, from both male and female writers. Authors studied include: Pérez Galdós, Emilia Pardo Bazán, Unamuno, Pío Baroja, María Teresa León, Ana Maria Matutes. Students study the history of Spanish theater with special emphasis on the 20th century including authors such as Benavente, Valle- Inclán, García Lorca and Buero Vallejo. This course attempts to provide the student with a complete and integrated vision of the different forms of business communication presently available. It is sense, it seems bring to light both the difficulties and the wealth of the communication possibilities that can be developed. Outstanding Spanish music from Arabic-Andalusian music to the 13th century, Renacimiento schools, 17th century court music, the Zarzuela, 19th century nationalism and modern day trends. Music and illustrations are used. This course covers the origins and history of Flamenco as well as the forms, development and content of the music through song and lyrics, dance and guitar. Through the study of Flamenco songs, articles, books, film and documentaries, this course explores the poetic language of the lyrics, the artistic nature of this musical expression and the relationship between Flamenco and Spanish society and culture as well as its origin and destiny. This course studies the form of government in Spain, the democratic institutions, the model of territorial organization by the State, the political party system, electoral evolution in Spain and the political culture of the Spanish people. Conceptualization and theories of regional economic and political integration, antecedents and historical evolution of political integration in Europe. European Union participants, the creation and development of E.U. institutional supranationalism and basic principles of supranational constitutionalism. Political aspects of decision making and current dilemmas in the process of European integration. During the Middle Ages, the Iberian Peninsula was inhabited by men and women of the three monotheistic religions: Islam, Christianity and Judaism. This course aims to contribute to the acquisition of a better knowledge and understanding of the past and of Spanish culture, particularly through the study of the social relations, and religious and cultural backgrounds that were found in the medieval Hispanic multicultural societies. Importance and effect of Islamic influence on Spain’s history, tradition, life and culture. The concept of Islam, message of the Koran, Andalucia under Islamic rule, North African dynasties in Andalucia, cultural, literary and artistic aspects of Islam and Islamic architecture and symbols as exemplified by the Alhambra. A unified and integrated interpretation of Spanish civilization and today’s society in Spain. Themes of this complex cultural reality are the relationships between the professional, labor and cultural sectors of society, the aging of the population, gypsies, bullfighting, Spanish holidays, gastronomy and flamenco. Basic elements of Hispano-American culture are addressed to provide an understanding of its complexity. The American geographic environment, racial distribution and historical evolution, demographics and problems of growth, family structure and daily life, social groups and their behavior, political tendencies, current ideologies, dependence, underdevelopment, external debt, art and folklore. German, Arabic, Modern Greek, Portuguese and Russian each at 100 beginner, 200 pre-intermediate, 300 intermediate and 400 advanced levels. Students on the Internship Program take a 45 hour internship in a Granada based organization, 1 or 2 required Spanish courses depending on Spanish level and then choose 2 or 3 electives from the Spanish Language and Culture Programs in English or Spanish or the Advanced Hispanic Studies Program courses listed above. The internship course consists of a 14-hour internship seminar (12 hours of group seminar plus a 2-hour individual seminar with a University of Granada Internship Advisor) followed by 45 hours of internship at either a local company or at a local school for a recommended 3 credits. Internship opportunities are available in the areas of Education, with local NGOs, Health Centers, Communications, Web Design, Graphic Design, Video Production, Nutrition and Renewable Energies. The ideal internship placement is a coordination between the skills and personality that an organization is seeking and those which a student presents. Placements are made with both small and large organizations, and selection is based on a number of criteria. Students must attend interviews with suitable organizations as part of the internship selection process. Final selection is always at the discretion of the organization and the University of Granada Internship Coordinator. For further details of the Internship Program application and selection process please speak to your AIFS Admissions Officer. Courses are subject to change at the discretion of the University of Granada.